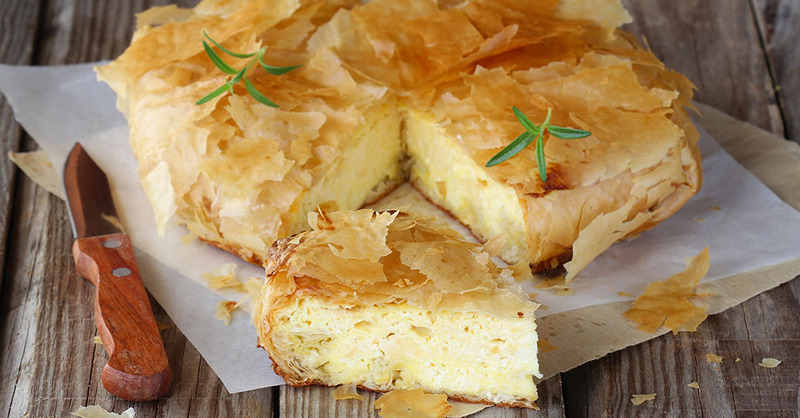 When we want some Greek influence, we go for a tiropita, or Greek cheese pie. This traditional dish works as either a midday snack or as a yummy dessert paired with hot tea or coffee. We like to change this savory dish to a sweet treat by sprinkling the top with cinnamon and sugar before serving; it’s perfect for a pleasant sweet-and-salty treat! Not only does this dish bring a taste of the Mediterranean to your home, but it’s surprisingly easy to make. We suggest saving a bit of time by using store-bought phyllo dough for that buttery, flaky crust. Preheat the oven to 350 degrees Fahrenheit. Grease a 9-by-12-inch glass casserole dish or 9-by-3-inch springform pan, and set it aside. Beat together ricotta cheese, cream cheese and heavy cream in a bowl. Stir in the feta cheese, Parmesan cheese, Gouda cheese and blue cheese. Mix the eggs into the mixture, and season it with fresh mint and freshly ground black pepper to taste. Chill the cheese filling for 25 minutes. Brush all the phyllo sheets with olive oil and layer half of them in the bottom of the prepared pan. Spread the cheese mixture over the phyllo sheets. Top the cheese filling with the remaining phyllo sheets, and brush the top sheet with olive oil to taste. Bake the cheese pie for 40 to 45 minutes. Allow the pie to cool for at least 20 minutes. Garnish with rosemary sprigs, serve, and enjoy!